British police have arrested six men after a video was posted on the internet that showed men mocking the deadly Grenfell Tower blaze by burning an effigy of the building as part of Guy Fawkes Night celebrations. The men were released on Tuesday, but remain under investigation, according to a police statement issued late in the day. 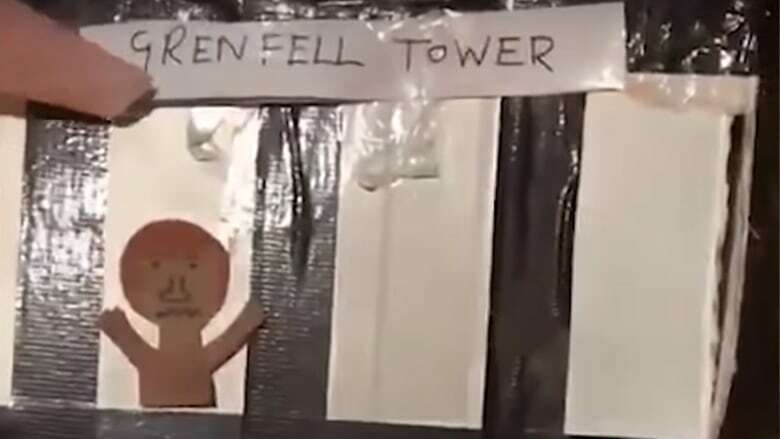 The video, which appeared on social media, showed a cardboard model of the tower with cut-outs of residents in the windows being set alight on a bonfire while those watching laughed and made jokes. Grenfell Tower, a social housing block that was home to a close-knit, ethnically diverse community, was engulfed by flames in the middle of the night of June 14, 2017, killing 72 people in the country's deadliest domestic fire since the Second World War. "To disrespect those who lost their lives at Grenfell Tower, as well as their families and loved ones, is utterly unacceptable," Prime Minister Theresa May said on Twitter. Khadijah Mamudu, whose mother and younger brother escaped the deadly firestorm, called the burning of the model a "vile act." Police said five men had been arrested on suspicion of a public order offence after turning themselves in at a police station in south London on Monday. A sixth man handed himself in to police on Tuesday. The men, who range in age from 19 to 55, have not been charged. Across Britain in early November, towns and villages hold annual firework parties and burn effigies of Guy Fawkes, the Roman Catholic plotter who tried to blow up Parliament in 1605. Larger celebrations often burn celebrity figures with effigies of flamboyant ex-foreign secretary Boris Johnson being torched at a number of events this year while previous targets have included U.S. President Donald Trump.